More Moebius Models- Classic Battlestar Galactica- Galactica Ship, Viper MK2, Battlestar Galactica BS-75, Viper MK-VII, Broadway Dracula, Superboy, Lost in Space Jupiter 2 & Kogar now in stock ! Pre-Order any model kit and save 10% off retail. Item #912 Battlestar Galactica-Colonial Viper MKII Model Kit $29.95 ea. In Stock New from Moebius models the Battlestar Galactica Colonial Viper MKII model kit is from the new tv series seen on Sci. Fi. channel, in 1/32nd. scale, includes decals & instruction sheet and Aurora style clear display stand, skill level 3, all boxes are near mint & sealed, paint & glue Not included. Item #915 Battlestar Galactica-BG-75 Galactica Model Kit $44.95 In Sock (ONLY HAVE 1) This new series Battlestar Galactica BS-75 is in 1/4105th. scale, is buildable with hanger bays in the in or out position, about 14" long when assembled, extremely detailed, display base looks like the Battlestar Galactica seal, all boxes are near mint & sealed, paint & glue Not included, skill level 3. Item #916 Battlestar Galactica-Colonial Viper MK-VII Model Kit $29.95 ea. 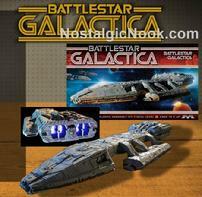 In Stock Another great Galactica kit from Moebius, Colonial Viper MK-VII as seen on the Sci. Fi. channel`s Battlestar Galactica, 1/32nd. scale, all boxes are near mint & sealed, skill level 3, the Mark Vll main weapons are 3 forward facing cannons, this viper is capable of atmosheric flight, paint & glue Not incuded. Item #942 Classic Battlestar Galactica Ship Model Kit $69.95 ea. In Stock This new 35th Anniversary Classic Battlestar Galactica - Galactica ship is extremely detailed, over 17" long when assembled, new updated decals, skill level 3, comes with a display stand, all boxes are near mint & sealed, is in 1/1405 scale, comes with clear parts, all plastic kit, paint & glue Not included. Item #913 Lost in Space - Jupiter 2 Model Kit $124.95 ea. In Stock This Moebius Models 18" in diameter Lost in Space- Jupiter 2 model kit, is sealed in near mint box, with over 200 pieces, extremly detailed interior, 1/35th scale, the entire upper hull lifts off to reveal interior, 2 fushion cores, 1 with fins extended, 1 with fins attracted, optional positional landing gear, outlines for Chariot & Space pod hatches, 3rd. season interior, skill level 3, box is 18" X 18" X 5" deep, loads of clear parts for lighting, paint & glue Not included. Look for the lighting kit on the Lost in Space page.. Item #659 Monster of the Movies- The Mighty Kogar Snap-Together Model Kit $29.95 ea. In Stock This original Mighty Kogar snap-together custom builder kit with optional parts include Bob Burns & Tracy the Gorilla heads, is in 1/12th. scale, all boxes are sealed and near mint. Mysterious beast of the jungle, the renegade ape who is said to have the soul of a child and the heart of a man- a friend to the innocent and a terror to the unjust, instruction sheet also included, paint & glue Not included. Item #478 DC Comics Superboy Figure Model Kit $34.95 ea. In Stock (HAS BEEN DISCONTINUED BY MOEBIUS MODELS) This Superboy figural re-issue model kit includes Superboy & Superdog Krypto as they find a dragon hidden in a cave, this new DC comics Superboy 1:8th. scale all plastic model kit, was original released in 1965 by Aurora, long box with great color graphics, this newly retooled version comes with engraved emblems, also comes with name plate, all kits are near mint & sealed, skill level 3, paint & glue Not included. Item #914 Bela Lugosi as Broadway Dracula Figure Model Kit $39.95 ea. In Stock (HAS BEEN DISCONTINUED BY MOEBIUS MODELS) This Moebius Models-Bela Lugosi as Broadway Dracula, is in 1:8th. scale, skill level 3, all boxes are near mint & sealed, includes Bela, cape, section of stone wall with wooden door that is 13 1/2" tall, stone floor base is 11" wide by 6 1/2" deep, with 44 parts, assesories include flaming torch, skull, rat & Amazing Modeler mini-mag and officially licensed by the Lugosi estate, paint & glue Not included.